I order quite often puzzle books from Amazon because I very rarely find those books in book stores in Finland. Since there are lots of different publishers they seem to invent something original like THE SUDOKU DIET or Revenge of Killer Sudoku and for kids Scary Sudoku Sticker Puzzles Book (Mickey Mouse Clubhouse). 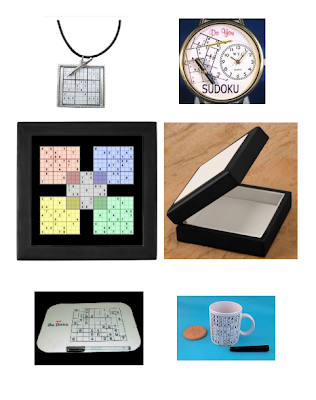 But like all celebrities, Sudoku has also all kinds of additional products for fans. Here are some interesting things I found. 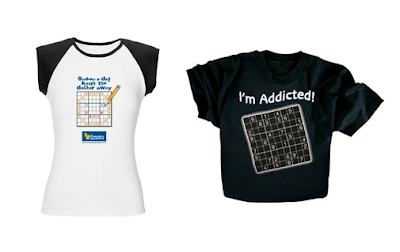 Even though I have tried to collect only things with sudoku to be solved I had to add these baby clothes from sudoku.ca. The text says: "If Mum is playing, tell her I'm hungry!" T-shirts have even more variations than books. 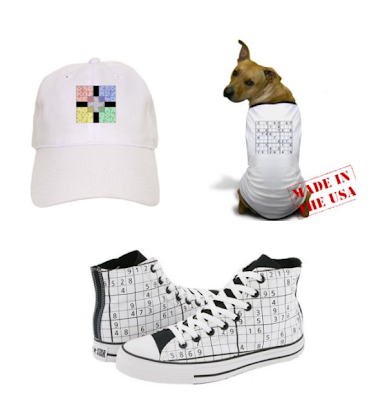 The largest collection of all kinds of products I found in Cafepress. All the products I have not linked elsewhere are from cafepess. The other shirt is from The Lighterside. 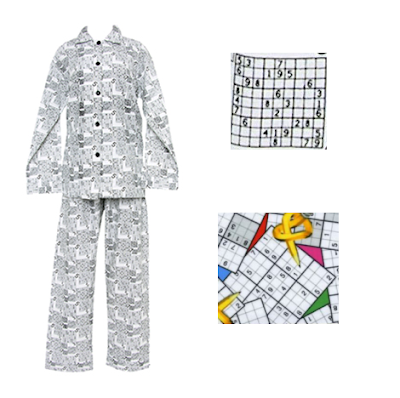 You can also sleep in a Sudoku (there is a small piece of the fabric shown), or you can make clothes with your own design. The pajamas are from The Pajama Company and the fabric was on eBay by jandofabrics. When you go out, you have to have a suitable outfit and you can use these. Of course your dog must match your clothing. The shoes are from Zappos. 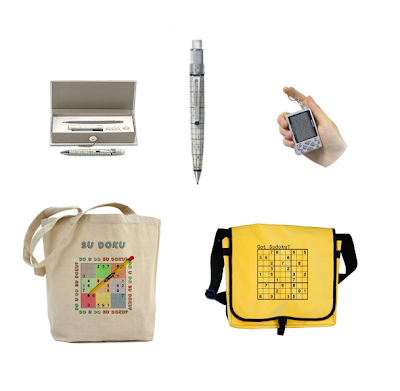 In addition to suitable clothes, you need personal things like pencils to fill the Sudoku’s, key chains and bags. The pencil is from Crane & Co., key chain from eBay and the bags from cafepress. You can also replace your jewelry with Sudoku and for the safekeeping of the necklace (This Next) and the gold watch (Amazon) you can use a keepsake box. You don’t have to work with your computer without Sudoku’s around. The mouse mat comes also with a pen (playr.co.uk). There are lots of coffee mugs to satisfy your coffee addiction (News from gadgets’ world). 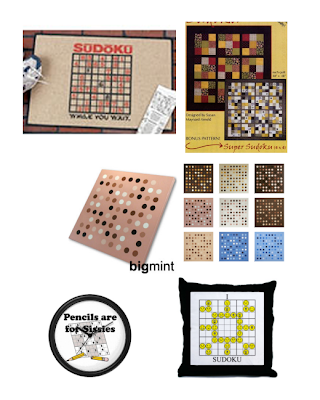 You can start by welcoming your quests with a Sudoku doormat (The Lighterside). Of course you will have self made handicraft on the walls. Patterns for these pieces of art can be found in Scarlett Rose. If you don’t have time to do them yourself you can also use designs from artists (Bigmint). The clock and pillows complete the impression. You can serve beer from ceramic steins, and use the tiles as drink coasters. I would like to use them tiling the space between the working space and cupboards. 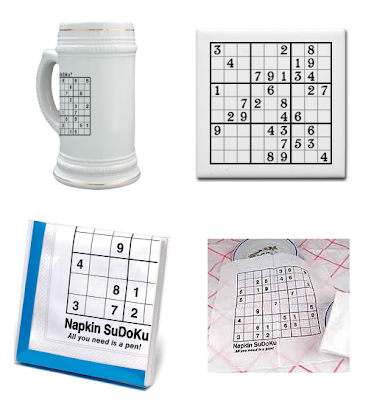 Napkins have also Sudoku’s (Jumping Giraffe). The last one is my favourite. 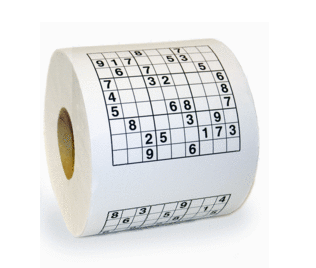 Sudoku toilet paper (Gadgets.co.uk) could however mean that the toilet visits last much longer than normally. 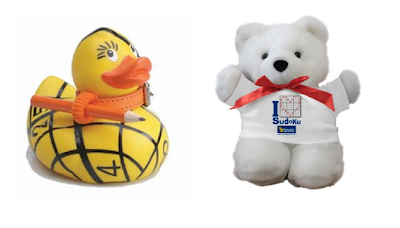 For children or childlike people they make bath time ducks (HELPTHEAGED) and Teddy bears. 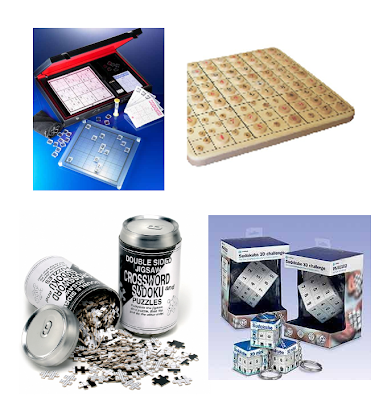 Also all kinds of game variations can be found like Glass Tabletop Sudoku Set (GadgetFind), Grand Master Wooden Su Doku Set (playr.co.uk), Double Sided Crossword and Sudoku Jigsaw in a can (Jumping Giraffe) and sudocube (News from gadgets’ world). If these were not enough, you could of course take a sudoku tattoo! You and your readers may be interested in a Sudoku event being held in Liverpool this week by Westin. Westin are turning the West side of Liverpool street Station, the Broadgate Arena, into a Sudoku Sanctuary that will be open from 10am -7pm between 5th and the 12th of May. It could prove a good place to unwind your mind and indulge your love of Sudoku. Between many of sudoku puzzle generators online I will suggest new one - SudokuArena.com. It has very nice graphics and patterns. Authors claims they built much better algorithm in their sudoku generator than what is available around. I checked the site and I liked the way you can choose how the game looks like, BUT their generator breaks one of the original rules of Nikoli (the first sudoku maker): the givens are always found in a symmetrical pattern. I have poured thousands of hours of my life into both Sudoku and Tetris, so when I found a game that combined the two, I knew I'd be hooked. The most awesome thing is the way the game makes use of the built-in motion sensor in my Mac... every time I tilt my Powerbook, it makes the tiles move on screen! Genius!